On Earth Day my students were lucky enough to Skype with Dr. David Haskell, author of The Forest Unseen: A Year’s Watch in Nature. Over the course of the school year the students have adopted their own mandalas, a square meter of forest space, and made monthly observations. I work with my biology colleague and the students have been learning how to communicate scientific knowledge to a general audience through informational writing, narrative writing, and poetry. It’s been a magical experience and one I can’t wait to continue next year. In October 2012 my former colleague Jon Olsen and I read an article in The New York Times Science Times about Dr. Haskell with our freshmen. The article struck a chord and we reached out to Dr. Haskell on Twitter. He spoke with the students and eventually we set up a brief Skype session so he could talk about the overlap between the humanities and science. The Skype session went so well that we decided to use his book as a touchstone text between English and biology this year. We placed an order for 80 copies of the book and started planning. We knew we wanted a field study and writing component to go alongside the book and we worked on ideas for the next few months. In September we introduced the book to our students. They were a little unsure at first because we were telling them that biology and English would work together during the year, combining our classes at least once each month. Thankfully, my school embraces interdisciplinary work so they “saw the light” very quickly. Over the course of the year our current freshmen have read a variety of essays in Dr. Haskell’s book. In September we broke them into 2 groups of 40 and within the groups broke them into triads. Those triads worked together all year, finding mandalas close to each other and relying on the buddy system during our field studies. They observed organisms, practiced using specialized vocabulary, wrote poems, and sat outside during the polar vortex. We’ve been rained on, sleeted on, snowed on, and now it’s finally starting to warm up. We’ve seen the circle of life, complete with a dead deer carcass in one mandala and a fierce cardinal defending its turf in another. Sept – perception / selecting & mapping mandalas (preface, April 14th & Sept 23rd): Mike and I chose the same readings and challenged the students to figure out why an English and Bio teacher chose the same ones (without planning it that way). Oct – respect / identifying a resident organism (March 13th & April 22nd), writing a descriptive paragraph modeled after Dr. Haskell’s. Nov – ecological succession / change / spectrophotometry & color / wavelengths (Nov 5th), writing a poem modeled after a few nature poems we studied in class. Dec – adaptations (structural & behavioral) / breathing / your response to cold (Jan 21st & Dec 3rd,) writing a description of the way the cold infiltrates the human body. Jan – patterns / Kepler’s snowflakes (Jan 17th), studying snowflakes and writing haikus. March – equinox / seasonal change, preparing for Dr. Haskell’s visit. You can see a sample of the instruction sheet here. Each month it changes based on the focus. This is one of the best projects I have ever been involved in. The biology and English combination is pure magic and I love having the opportunity to teach a bit of science communication. Dr. Haskell took an hour out of his day earlier this week to read some of the students’ writing, look at their Flickr group, and share his expertise. It was fabulous and I couldn’t ask for anything better as an English teacher! Thank you to Dr. Haskell! Interdisciplinary work is the best. The world isn’t divided into neat little subject boxes like the constructs we model in schools. Life is messy, subjects mingle together. But communication, reading and writing, is vital regardless of the field students may choose to pursue. Appreciating the environment that surrounds them is also vital to our wellbeing as a species. A survey by ACT finds that 89 percent of high school teachers report their students are “well” or “very well” prepared for college-level work in the subject they teach, while just 26 percent of college instructors say incoming students are “well” or “very well” prepared for entry-level courses. Somewhere, there is a disconnect. High school teachers want to prepare their students for college writing and we feel that we are doing so. But college instructors aren’t seeing that on their end. That can probably be attributed to the fact that high school and college writing instructors rarely interact when it comes to pedagogy. There’s almost no line between high school English teachers and college writing instructors. Most high school teachers I know cobble together their knowledge of college writing from their own experiences and those that alumni share with them. But it’s time for that to change. This summer, my colleague Michelle and I are trying to put together a writing roundtable and we need your help! We are looking for college writing instructors to join us in a discussion about the transition from high school to college writing. Our goal is to make that transition easier for our students and their college instructors. We’ve all heard the “rules”: no 1st person, no 2nd person, only use MLA, only use Chicago/APA, etc. It’s time to put an end to speculation and the broad generalizations. So if you are a writing instructor at the college level and can get to Freehold, NJ on July 8th, please join us! I am the luckiest teacher in the world. I work with the most fantastic teachers and this year I’ve connected with some of the English teachers in other buildings in our district. Michelle and Kelly are awesome and we are so on the same page when it comes to tech and promoting English in our STEM-oriented schools. Earlier this year Michelle and I were brainstorming ways to do more inter-academy activities in the humanities. Michelle mentioned that she used Googledocs to run some fun writing contests in her classes and I brought up the idea of taking that idea and extending it to all of our academies. Thus was born the first annual inter-academy writing contest! We ended up holding a flash fiction contest. Students were charged with writing a 6 sentence story (no more, no less!) and were give about two weeks to enter. All entries were collected via the Googledoc survey. Students could enter as often as they wished until the deadline and we advertised the contest in all five of the academies. Within just a few days we had entries from every school! After entries closed, we all popped into the Googledoc to choose the finalists. We wanted two finalists from each school and we were able to hide the column showing the name of the student who submitted the entry, so we were able to judge “blind”. Using the chat feature in Googledocs, we were able to discuss our choices as we made them. We ended up with 160 entries, which was INSANE. It took us a lot longer than we planned to narrow down the choices so we didn’t have the finalists chosen for the National Day on Writing, as planned. However, I’m ok with that because we managed to get so many students involved in the contest! Our finalists have been chosen and the anonymous stories are now posted in a single googledocs survey. We posted the survey tonight and students are able to vote until Wednesday. The winner will receive two trophies- one for them to keep and one for their school trophy case. The school trophy will be passed to the winning school every year, like a Super Bowl trophy. Yay for writing!! How did you celebrate the National Day on Writing? I write because I have always written. I write because it feels strange not to write. I write because I want to write. Submit student essays to Figment.com: Figment will be accepting submissions from September 28 through October 29. Since “Why I Write” is a celebration of writing, there are no prizes, but a curated anthology of selected submissions will be available as an e-book later this winter. Submit to Figment. New York Times Learning Network: The New York Times Learning Network will present a series of interviews with reporters who cover a range of beats and explore their writing process. These interviews will serve as the basis for lesson plans, prompts for students, discussions, and inspiration. Edutopia: Edutopia will be celebrating “Why I Write” with a series of blogs by NWP writers. Each blog will then invite readers to share why they write with others in the Edutopia community. These conversations will take place on the Edutopia.org website and within our communities on Twitter and Facebook. NWP Radio: On October 20 at 7 p.m. EST, the National Writing Project will air a live radio show to celebrate the National Day on Writing with interviews with New York Times education reporter Fernanda Santos, New York Times Learning Network editor Katherine Schulten, Figment founder and New Yorker staff writer Dana Goodyear, Figment teen writers, and NWP teacher and author Ashley Hope Perez, among others. Visit Why I Write for more information and links to essays from tons of authors about why they write. 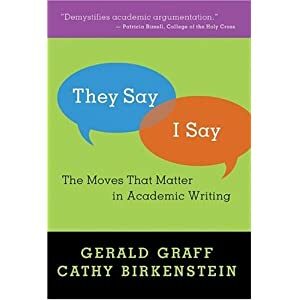 If you teach writing at the secondary level, you need to order this book immediately. I ordered it on a whim last year and couldn’t believe my luck when I read it. It was like I stumbled into a gold mine, full of little nuggets of writing genius. 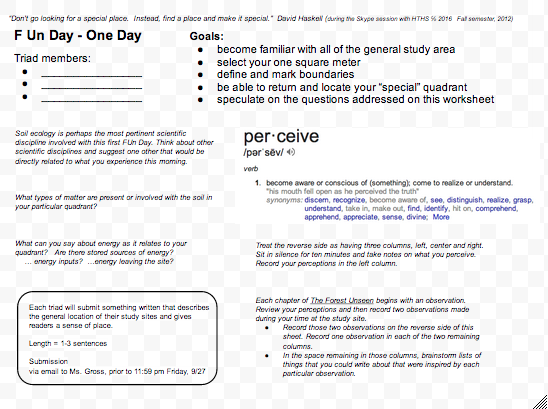 I started using it with my freshman writers and their analytic writing improved dramatically. They referred back to the lessons all year long and I was stunned by their growth. The ideas really stuck with them. They Say/I Say: The Moves That Matter in Academic Writing is intended to guide writers away from the pre-packaged five paragraph essay. Instead, it leads students into deeper analytical thinking by having them respond to the ideas in the text they are reading. It’s full of sentence starters that help kick off writing, but then the students have to carry it the rest of the way. It’s the perfect blend of a template and the freedom to write. And it doesn’t encourage a five-paragraph essay! Instead, it encourages essay writing. That’s it. Just writing. No silly length requirements. And I love it. Highly, highly recommended to writing/English teachers.